Western blot analysis of extracts from PANC-1, HeLa, and RD cells using eIF4B (1F5) Mouse mAb (upper) and β-Actin (D6A8) Rabbit mAb #8457 (lower). 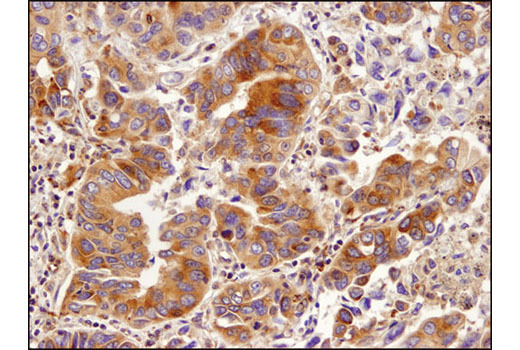 Immunohistochemical analysis of paraffin-embedded human lung carcinoma using eIF4B (1F5) Mouse mAb. 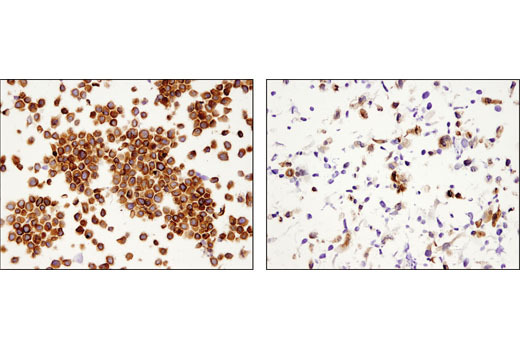 Immunohistochemical analysis of paraffin-embedded HeLa (left) and RD (right) cell pellets using eIF4B (1F5) Mouse mAb. 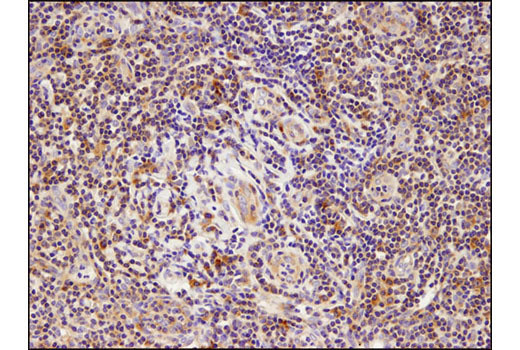 Immunohistochemical analysis of paraffin-embedded human tonsil using eIF4B (1F5) Mouse mAb. 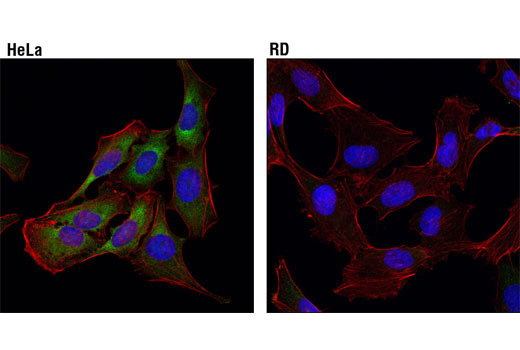 Confocal immunofluorescent analysis of HeLa (higher expression, upper) and RD (lower expression, lower) cells using eIF4B (1F5) Mouse mAb (green). Actin filaments were labeled with DyLight™ 554 Phalloidin #13054 (red). Blue pseudocolor = DRAQ5® #4084 (fluorescent DNA dye). 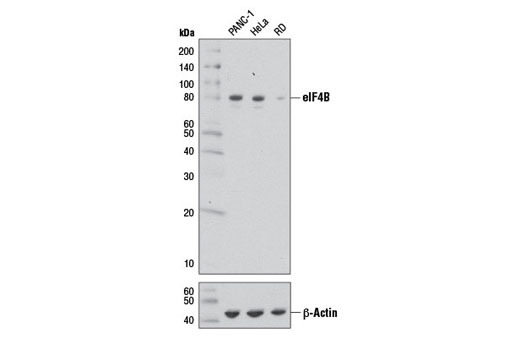 eIF4B (1F5) Mouse mAb recognizes endogenous levels of total eIF4B protein. Monoclonal antibody is produced by immunizing animals with a recombinant fragment around Val473 of human eIF4B protein.